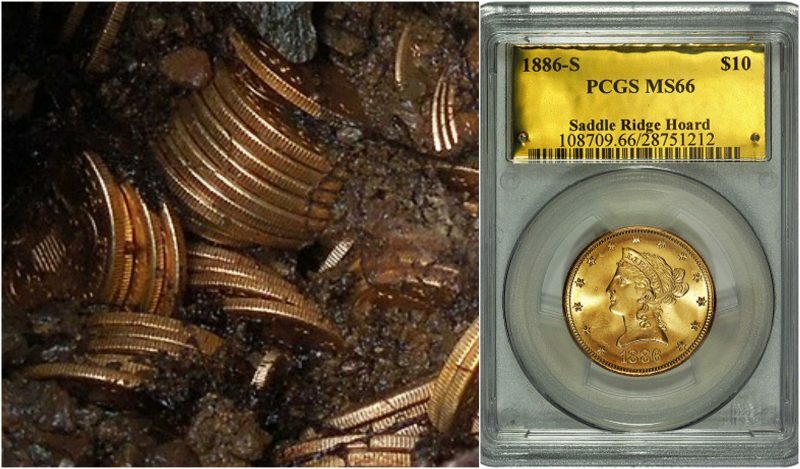 The Saddle Ridge Hoard is the name given to identify a treasure trove of 1,427 gold coins unearthed in the Gold Country of the Sierra Nevada, California in 2013. The face value of the coins totalled $27,980, but was assessed to be worth $10 million. In total, the hoard contains $27,460 in twenty-dollar coins, $500 in ten-dollar coins, and $20 in five-dollar coins, all dating from 1847 to 1894. The collection is the largest known discovery of buried gold coins that has ever been recovered in the US. 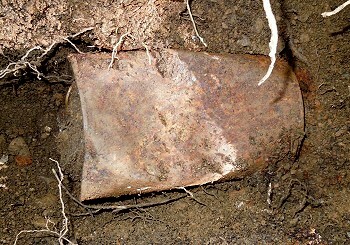 The Saddle Ridge Hoard was discovered in February 2013 on private property located in California Gold Country. Due to privacy concerns, the exact location of the discovery has not been disclosed, other than to confirm that the land is located in a hillside area of Gold Country, near the site of the Gold Rush of 1849. 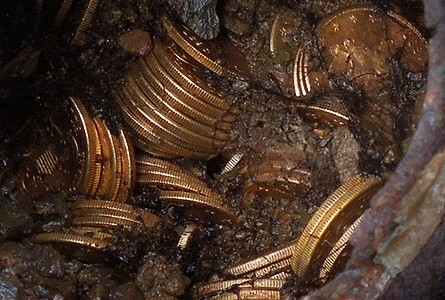 As of 2014, the couple who discovered the hoard have chosen to remain anonymous. Known only as John and Mary, the middle-aged, married couple have lived on the rural property for several years and have no idea who buried the coins. They wish to keep their identity, location, and ownership history of their home private, in order to avoid treasure seekers from trespassing on their property in an effort to find more gold. The owners of the property discovered the trove while they were walking their dog. Although they had reportedly hiked the trail numerous times, it was not until they spotted a rust-covered metal can poking out of the ground that they chose to explore further. Before finding the trove, the couple had noticed some unique features of the area. They recalled seeing an old empty can hanging from an old tree. The can had evidently been there so long that the tree had literally grown around it. At the time, the couple surmised that the hanging can had possibly been used to hold flowers and mark a grave. They also noticed an oddly shaped rock on the nearby hill, which they nicknamed “Saddle Ridge”. After they found the gold, they realized that the geographical features and the hanging can were probably markers to the site, placed by the original owners. The center of the treasure trove was located ten steps between the jagged rock and the direction of the North Star. After Mary noticed the can, John bent down to pick it up, but found that it was stuck in the dirt. He began to use a piece of wood to pry it from the ground. It was so heavy that they believed that the can likely held lead paint. On their walk back to their house, struggling to carry the weight of the find, the lid of the can cracked open, revealing the edge of a single gold coin.They returned to the site with some hand tools to see if they could find anything else. They found another can about a foot away from where the first can was discovered. Although it was partially decomposed due to rust, it held several more coins. They continued to return to the site to look for more coins, primarily digging in the ground and eventually using a metal detector. Their work eventually resulted in the discovery of eight cans filled with 1,427 coins. After their discovery, the couple protected their find by hiding it in an old ice chest, then burying it under a pile of wood and concealing the location. After some initial research, they contacted the numismatics firm of Kagin’s in Tiburon, California, who is representing the owners.